Step back in time with the perfect blend of old and new in this fully renovated Farmhouse located near the headwaters of the Falling Spring. Whether you love history, trout fishing, festivals or antiquing, this area has it all. Beautiful views of mountains, farmland, pastures and streams make this an ideal place to relax, or rest after a day of sight seeing Dutch country, Gettysburg and local Wineries. Gary and Suzanne purchased 12 acres of the original homestead farm at the headwaters of the Falling Spring. Gary is from the area, and Suzanne is from historic Charleston, SC. Gary is a retired manager from a local hospital and, and Suzanne is a retired Realtor and real estate Appraiser. Gary loves to garden and if visiting in the summer, you might find a basket of fresh vegetables on your front porch. In our search for a location near Gary's hometown, this property was irresistible to us as we looked for a property that was peaceful and scenic, had water, a few acres, historic value, mountain views and the convenience of downtown. The farmhouse has beautiful views of pasture land, ponds, and outside hardscape. The refinished 217 .year old floors add character as well as the 1 and 1/2 foot thick limestone walls. The original part of the house has the deep window sills, and the house has been furnished with antiques and modern day furniture. With the extensive remodeling, you will have all the conveniences of today, in a setting that brings to mind the history of the area. Visit places like the Historic Capitol theatre, Franklin County Historical Society, many wonderful restaurants local and national restaurant chains, retail stores. Penn National golf course is about 4 miles away. North and South Mountain ranges within 20 miles. Caladonia State Park has hiking, swimming, fishing, picnic tables, campgrounds, lodge, as well as the Appalachian Trail. Whitetail Resort is 30 miles away. Ski Liberty is 27 miles away, and Ski Roundtop is 51 miles away. When there is at least 4" of snow, guests may cross country ski (untracked) and sled around the property. Talk to the owner for details. The Headwaters of the Falling Spring, great for trout fishing. PA license required, catch and release. Stainless steel side by side refrigerator/freezer withf water and ice dispenser. China setting, utensils and glassware for 8, pots, pans, microwave safe cookware. The kitchen has an eatin area. Beautiful landscaping, with seasonal annuals perennials. There are stone steps to the first floor living level. You must be 21 to book this home and an adult of age 21 or older must occupy the property each night of the reserved stay. A very comfortable home equipped with everything you need. 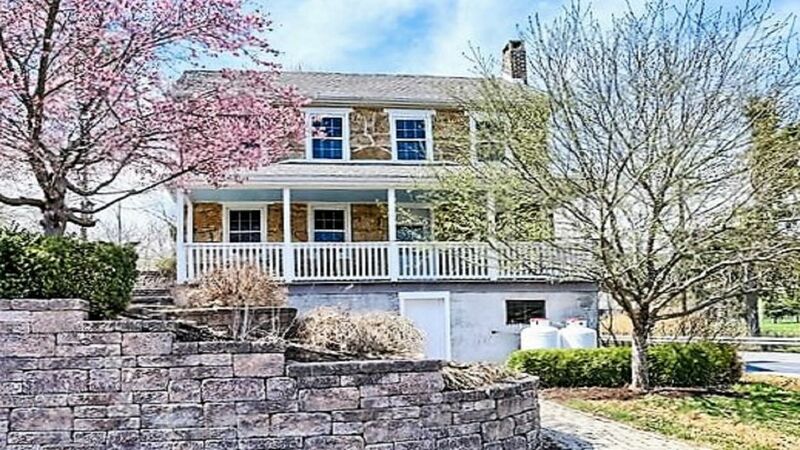 This home also gives you a feel of the past with part of it being build 1800 circa. Thank you for staying with us during your business trip. We are glad you were comfortable and had what you needed. We appreciate the care you took of our home and we welcome you back anytime. the house was well maintained and it provided everything we needed. It was up to date and clean, a good place for our family visit. Hi Steve, Thanks for choosing us for your family Thanksgiving. We appreciate your business. For our annual weekend get-together, our little group found a lovely and cozy home in Chambersburg. Comfortable beds, full kitchen, easy entry, and Suzanne is nearby if needed. The house is very near a road, but none of us had any problem with noise and slept well. We spent a day in Gettysburg, a pleasant drive away. Several other destinations are not far away. They even gave us some "overflow" vegetables from their garden to take home!! We enjoyed getting to know you and are so glad our home worked well for you. You took wonderful care of our home and we appreciate it. We hope you will come back again for your future get together. Thanks for choosing us! It didn't take long to realize what a gem this home was. The location is very central to lots of amazing places. The home itself is extremely cozy. The beds are so comfy as well. I cannot think of any negatives. Thank you Suzanne and Gary! We will certainly come back when we are in the area! We are so glad you chose us for your "last minute" getaway! Jen, your communication skills are so friendly, I felt like I knew you before you arrived. You took wonderful care of our home and we welcome you back anytime. Thanks for the kind review and we hope to see you again soon. My friends and I were in the Chambersburg area to hike several days on the AT. Suzanne’s house could not have been more perfect. It is conveniently located, well furnished and very clean. It was so nice to come back here at the end of the day and cook a great meal, hang out and enjoy the evening. Suzanne was available for any questions we had and she even shared vegetables from her garden. We hope to be back in the spring! Anne and her group were a delight! We enjoyed having them stay for their vacation. We would welcome them back anytime. Thanks Anne for taking such good care of our home. I can’t think of anything to say about this wonderful home and owners that hasn’t already been said! We’ve stayed in many VRBOs and this would be at the top of our list of favorites! Very fortunate that Gary and Suzanne have made this beautiful old home available to us travelers. Thank you again SO much. Get your skis, snowboards, snow shoes, and bundle up to stay with us during the winter. It's an easy commute as we are 27 miles from Ski Liberty, 30 miles from Whitetail, and 51 miles from Ski Roundtop. Many Spring, Summer and Fall Events and Festivals. We charge $10 per person, per night, over 6 people. The additional guests are subject to the owner's approval prior to booking. There is a 3 night minimum on a major holiday such as Thanksgiving, Christmas, New Years, Easter, Memorial Day, 4th of July, and Labor Day.